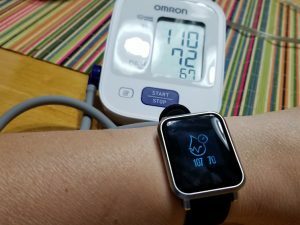 Testing Out a New Blood Pressure Watch and My Electric Bike is Here! One of the most popular subjects on The Journier are inexpensive blood pressure watches and it’s been a while since I’ve reviewed a fitness tracker that also measures blood pressure. I’m interested to see if the technology and accuracy has improved since I did those first reviews over a year ago. The watch I’m testing currently is the on Amazon which is a rebranded version of the SN60 Sports Band. 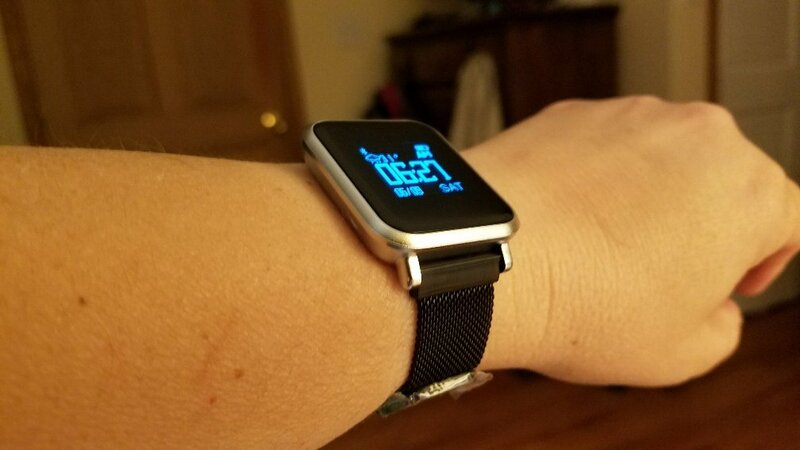 The current price on Amazon is and this one comes with two watchbands, a metal milanese version and what looks to be a silicone sports strap. 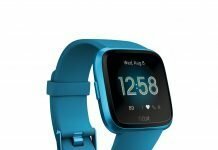 The SN60 is a nice looking watch and the watch body is made of zinc alloy metal which is an upgrade over what your typical generic fitness tracker is composed of. It’s also water resistant to 50 meters and can be worn swimming and swimming is supported as an activity. 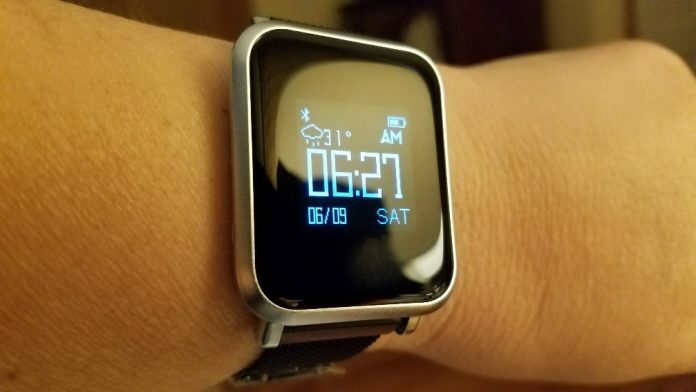 Not many of your budget fitness trackers have a 5ATM rating for water resistance. Other activities the Jesam Fitness Tracker (SN60) will measure besides swimming include: running, cycling, basketball, table tennis, badminton, climbing, and football. So far, step tracking and resting heart rate are testing out very good, although I haven’t tested the heart rate sensor during an activity yet. The main reason I wanted to test this particular watch was because it measures blood oxygen and blood pressure. This isn’t a FDA approved device so you want to keep that in mind. 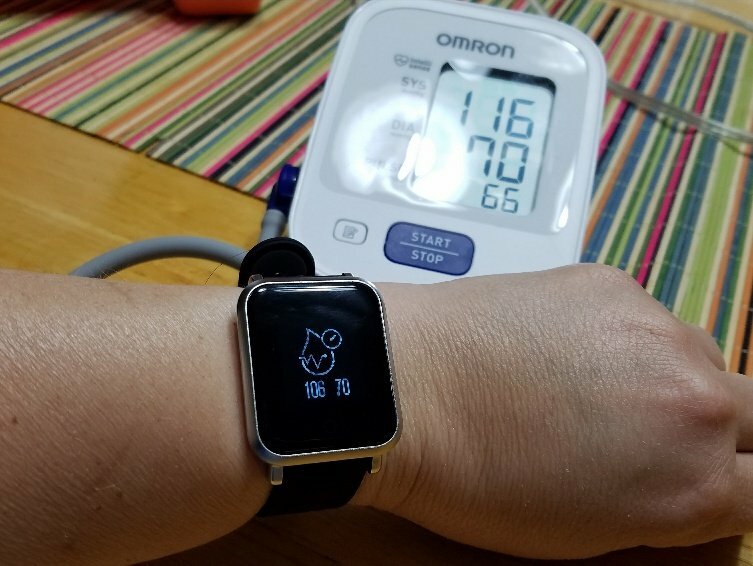 You’ll still want a FDA approved blood pressure monitor at home to compare the results to in order to ensure a reasonable range of accuracy. 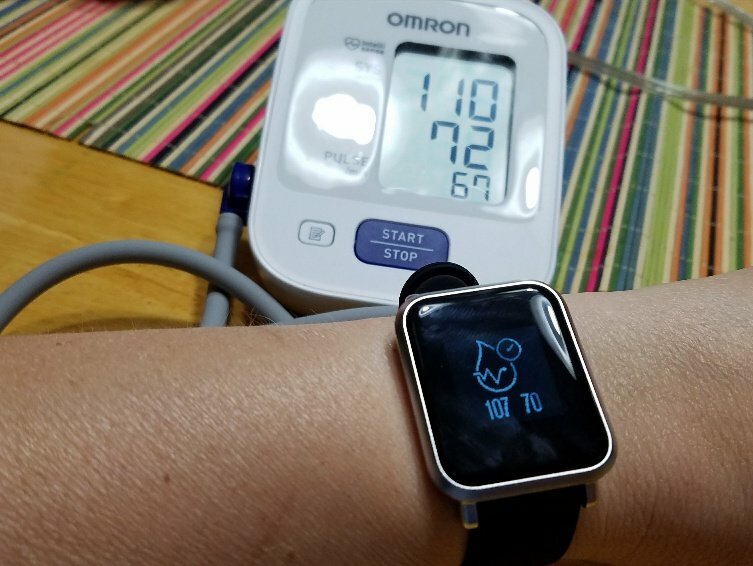 In my first few tests against the Omron Series 3 blood pressure monitor the results have been promising but I still need to perform several more tests over the next few days. The instructions didn’t indicate how I should position my arm when measuring blood pressure, so I’ll need to try some different positions but typically you want the watch level with your heart and you also want to be sitting in a chair with your feet on the floor. Also, I’ve discovered it’s important to sit for 3-5 minutes so your blood pressure can settle to its resting level to obtain more accurate results. Even with the Omron my blood pressure varies between measurements taken just a couple minutes apart. Also, these tests were not performed at the exact same time because the tight cuff on my arm would have thrown off the results of the watch. 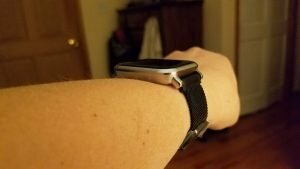 I’ll try measuring using the cuff on my right arm and the watch on my left so I can measure at the same time. Check back for the full review and I will update this article with a link to it when it is ready. 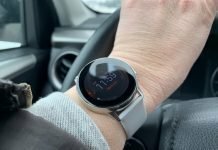 I sure hope it tests out well because I know there’s a lot of interest in a watch that can accurately measure blood pressure or at least within a reasonable range of accuracy. 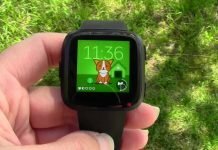 The full review is ready! 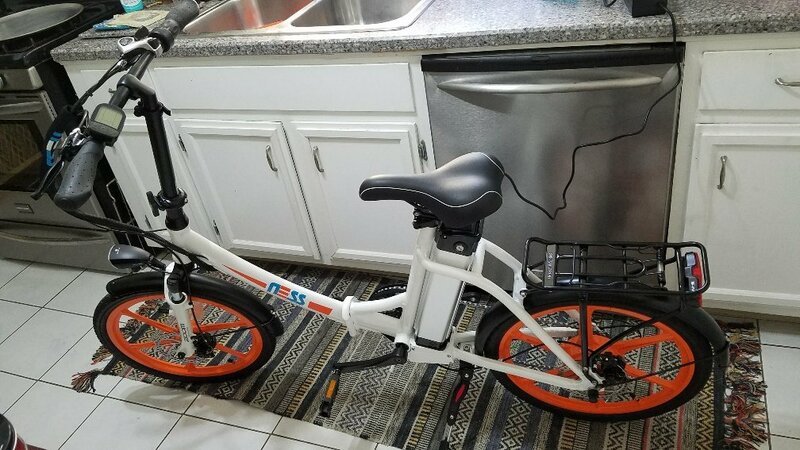 Another item I will be reviewing over the next few weeks is the NESS Icon E-Bike. It arrived yesterday and I haven’t had a chance to ride it yet but I think it’s going to accommodate my 5’1″ height very well. That was something I was worried about since I purchased it online and couldn’t try it out first. The bike looks small in the above photo but in person it doesn’t look small to me or like a kid’s a bike. It’s actually about as long as what many average full-size bikes are and the seat post and handle bar post can be raised. I just have it set low for my height. But even having the seat set so low I’m still able to get good extension on the pedals which is another thing I was concerned about. It came packaged well but I’m going to have to run out and get a metric hex wrench to tighten the handle bars. The instructions indicated that it came with a wrench but I sure didn’t see it anywhere. One thing I noticed is that even though the battery shows it’s fully charged, the LCD display never shows it fully charged. It shows it at 3 out of 4 bars. I’ll have to contact NESS and see what can be done about that. I read another review in which someone else had this same issue. Hopefully, I won’t have to change the display out, though I’ll probably upgrade to a better display later – one with more than 4 battery level indicators. We’ll see how it goes. Update: The display did show the battery fully charged when I took it out for its’ first ride, so that’s good! Definitely much more to come on this later. I have a lot of riding to do!